Visiting a medical professional can be stressful. When hearing diagnoses and descriptions of our ailments, we often run into language that is unusual and difficult to understand. It is helps to understand our diagnosis by understanding what certain words mean. Two of the most frequent expressions that we hear are myalgia and myositis. In the following article, we will describe and examine the meanings of these words. A symptom of injuries and diseases, myalgia is a medical term meaning “muscle pain”. Pulled or stained muscles that are caused by tearing or bruising of muscles fibers often results in pain and mobility issues. Chronic fatigue syndrome, restless leg syndrome, viral infections and other medical conditions are often source for chronic myalgia. Known for being another common symptom of injuries or diseases, myositis is also a medical term meaning “muscle inflammation.” This inflammation may be caused by a variety of influences. Infections and autoimmune reactions are common causes for myositis. These symptoms may be temporary or chronic and they may be mild or severe. Any occurrence that may cause a bruise or tear in the muscle will likely result in myalgia. This can be due to strain, tension or hemotoma. Excessive use, either by duration or intensity, may cause the muscle to become strained. Muscle tension caused by stress may also result in muscle pain. A hemotoma that is caused by damage to the flesh or skin is also a factor that may lead to pain. These cases are generally temporary and restricted to a single region, and these may be defined as localized or acute myalgia. Myositis is generally the result of autoimmune reactions or infections. However, pharmaceuticals may cause inflammation as well. Autoimmune reactions and infections may also influence myalgia and associated pains as well. Common autoimmune disorders are multiple sclerosis, lupus, polymyositis, erythmatosus and others. Medications such as statins and fibrates may result in myalgia and myositis as well. Swelling and muscle pains are often signs of pulled or strained muscles. This commonly occurs in athletes, laborers and during accidents. Compression and cooling packs are beneficial for reducing these pains. Elevating the affected body part is also helpful in reducing pain. It is best to allow the body to relax and recover on its own. Using pain medication may help, however pain is a natural response that informs you when it is safe to move again. Try not to overuse your body when it is in need of treatment and relaxation. Severe injuries should be treated by a medical professional as more serious problems may occur over time. Bacterial and viral infections such as Lyme Disease and the flu can result in myalgia and myositis. 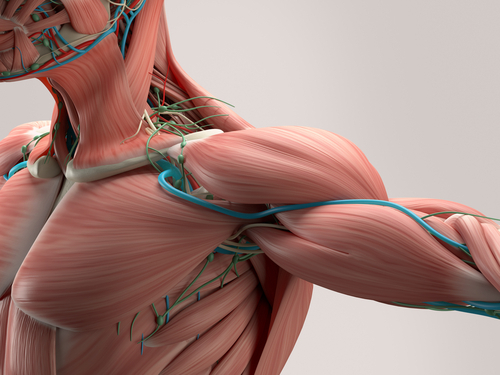 Weakness and pain of the muscles is a common occurrence. Fever, sweating, lethargy and nausea may be associated symptoms. Due to the nature of infections, it is beneficial to seek medical attention if you determine that you may have an infection. Antibiotics are often used to treat infections. Home remedies may work as well, though it is advisable to have a licensed practitioner give a diagnosis and provide treatment. Genetics and viruses may be the cause for many autoimmune based symptoms of myalgia and myositis. It is always advisable to speak with a doctor if you believe that you have an autoimmune condition. If possible, speak with family members regarding any conditions that you may have inherited. Polymyositis and dermomyositis may be associated symptoms of cancers. These may be a result of genetics, viruses or injuries, though many cases are unsolved and may be caused by unknown sources. Immunosuppresants and steroids may be prescribed by a doctor and have been shown to be helpful in treating these symptoms. Pain and inflammation may be accompanied by weakness and loss of muscle mass. Physical therapy and exercise may be beneficial in the reconstruction of muscle tissue. If you determine that your muscle pains and inflammation are not caused by an injury or an infection, then it may be beneficial to speak with a doctor. If the pain become excessive and unmanageable, then monitor your experiences so that you can accurately describe your symptoms and their potential causes. It is important to take care of your health. Do not allow potentially serious concerns to go untreated as they may become exacerbated with time.